Home Hip Fractures: IM Nail or Sliding Hip Screw? 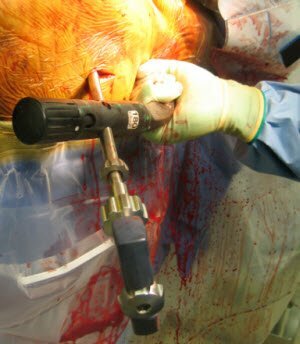 Dr. Simon Mears reviews the pros and cons of 2 fixation methods used in the surgical management of intertrochanteric hip fractures. The Cochrane database has shown that there is little difference in outcomes with these devices,  although there is some evidence that, for simple fractures, SHS results in better outcomes and fewer reoperations. The IHS is thought to be superior for the treatment of unstable intertrochanteric hip fractures, especially those with no lateral wall support. [9,10] However, it is sometimes difficult to notice the degree of comminution or lateral wall support until intraoperative radiographs under fluoroscopy are obtained. Fracture stability and pattern should be carefully considered when selecting between the two devices. High-quality radiographs are important for fully evaluating the pattern of the fracture. Stress radiographs or computed tomography scans may also be helpful in this regard. SHS will work well with fractures classified as 31-A1, which are thought to be stable patterns. The lateral wall is intact, giving a stop to the sliding of the screw. Reverse oblique patterns and subtrochanteric fractures (31-A2.2, 31-A2.3, 31-A3) are unstable. The screw will keep sliding, putting all of the force on the plate bone interface, which will lead to early failure. It is difficult to evaluate the stability of fractures classified as 31-A2.1 and 31-A2.2, which are characterized by comminution of the medial calcar. Larger fractures of the medial calcar contribute to fracture instability. In addition, there may be comminution of the lateral wall. Lateral wall fracture can be difficult to see on radiographs and may also occur during the surgery itself,  which converts a stable pattern to an unstable one. A SHS can be used very successfully, especially for stable fractures. The key is correct placement of the lag screw: It must be centralized or inferior in the femoral neck and deep within the head. Side plates of varying lengths are available for use with the SHS. Two screws are sufficient for stable fractures. The concept of longer plates for unstable fractures leads to longer incisions and no change in the biomechanics of the device. In these cases, an IHS device, rather than a longer plate, should be selected. Several IHS devices are available, with a long or short IM component. In general, the more unstable the fracture pattern and the further down the shaft the fracture extends, the longer the nail should be. Some surgeons believe that a longer nail protects the entire femur from additional fracture and they opt for a longer nail for every patient. However, there is little advantage to a longer nail for routine intertrochanteric fractures. In both the SHS and the IHS, the hip screw itself may be locked into the barrel of the device to prevent sliding of the nail from the screw, which makes the device into a fixed angle device. In general, the device can be allowed to slide in stable fracture patterns. Locking the screw in unstable fracture patterns may help prevent shortening of the fracture. Overall, the amount of sliding is higher when using the SHS because the nail itself blocks the continued sliding when using the IHS. Use additional small incisions to place tools to reduce fracture (Figure 1). 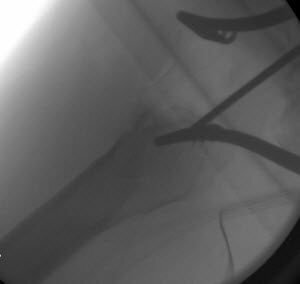 A bone hook can be helpful around the calcar to pull the proximal fracture fragment laterally. A Schantz pin can be inserted into the proximal femur and used as a reduction joystick, which can change the reduction of a subtrochanteric fracture fragment. A Cobb elevator can be placed through a lateral incision and used to press on an apex anterior deformity for reduction (Figure 2). A fracture reduction tool can be helpful in reducing the fracture and getting the guide wire into the distal femur (Figure 3). For difficult reductions, the fracture must be opened further and held with reduction forceps. Attempts should be made to try to reduce fracture site stripping, but reduction of the fracture is paramount. On the anteroposterior plane, the pin should err toward the medial side of the trochanter to prevent reaming the lateral wall (Figure 4). The initial guide pin needs to be carefully centered on the trochanter in the lateral plane (Figure 5). The canal should be reamed if necessary before nail placement to prevent femoral fracture. The nail often needs to be inserted further than might be thought necessary to position the hip screw into the center or inferior part of the femoral head. The guide wire wants to migrate proximally and not stay centered (Figure 6). To prevent this migration, an abduction force on the handle of the nail can be useful. Drilling in reverse can also sometimes help the guide wire go straight. 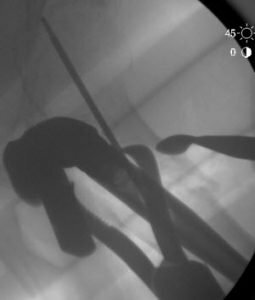 Another trick is to use a larger-diameter long drill bit instead of the guide wire after the proper orientation on anteroposterior and lateral views have been confirmed. An assistant should keep a hand on the nail insertion guide while the hip screw guide wire is inserted so that the nail does not migrate proximally during insertion (Figure 7). Figure 1. A fracture reduction tool is placed through a small stab wound to help push medially on the proximal fracture fragment. Figure 2. This lateral view (left) shows an apex anterior deformity despite derotation with a clamp. The fracture is further reduced with a Cobb elevator (right). The elevator can be placed through the incision used to place the hip screw. Figure 3. A fracture reduction tool is used to help reduce this subtrochanteric fracture. Figure 4. 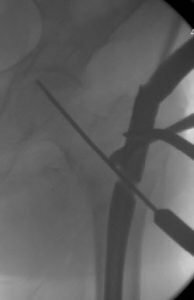 The guide wire should be on the tip of the trochanter on the anteroposterior view. The guide wire should err medially and not laterally to prevent reaming the trochanter. Figure 5. 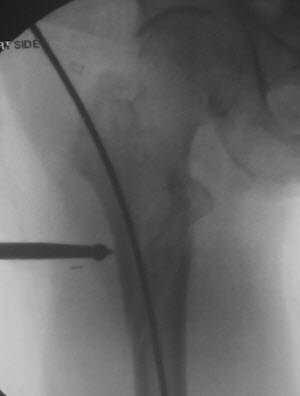 A lateral view showing the pin centered in the trochanter and headed down the shaft of the femur is critical to assure reduction. Figure 6. A guide wire is placed too high into the femoral head (left), which would result in poor placement of the hip screw. The guide wire has been repositioned (right) to be central in the femoral head. Figure 7. The assistant should place a hand on the nail insertion guide during guide pin insertion to prevent proximal migration of the nail. Fan L, Dang X, Wang K. Comparison between bipolar hemiarthroplasty and total hip arthroplasty for unstable intertrochanteric fractures in elderly osteoporotic patients. PLoS One. 2012;7:e39531. Haentjens P, Casteleyn PP, De Boeck H, Handelberg F, Opdecam P. Treatment of unstable intertrochanteric and subtrochanteric fractures in elderly patients. Primary bipolar arthroplasty compared with internal fixation. J Bone Joint Surg Am. 1989;71:1214-1225. Moroni A, Faldini C, Pegreffi F, et al. Dynamic hip screw compared with external fixation for treatment of osteoporotic pertrochanteric fractures. A prospective, randomized study. J Bone Joint Surg Am. 2005;87:753-759. Norris R, Bhattacharjee D, Parker MJ. Occurrence of secondary fracture around intramedullary nails used for trochanteric hip fractures: a systematic review of 13,568 patients. Injury. 2012;43:706-711. Osnes EK, Lofthus CM, Falch JA, et al. 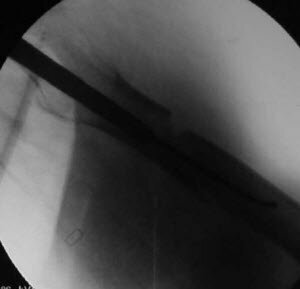 More postoperative femoral fractures with the Gamma nail than the sliding screw plate in the treatment of trochanteric fractures. Acta Orthop Scand. 2001;72:252-256. Anglen JO, Weinstein JN. Nail or plate fixation of intertrochanteric hip fractures: changing pattern of practice. A review of the American Board of Orthopaedic Surgery Database. J Bone Joint Surg Am. 2008;90:700-707. Parker MJ, Handoll HHG. Gamma and other cephalocondylic intramedullary nails versus extramedullary implants for extracapsular hip fractures in adults (review). Cochrane Database Syst Rev. 2010;CD000093. Matre K, Havelin LI, Gjertsen JE, Espehaug B, Fevang JM. Intramedullary nails result in more reoperations than sliding hip screws in two-part intertrochanteric fractures. Clin Orthop Relat Res. 2013;471:1379-1386. Matre K, Havelin LI, Gjertsen JE, et al. Sliding hip screw versus IM nail in reverse oblique trochanteric and subtrochanteric fractures. A study of 2716 patients in the Norwegian Hip Fracture Register. Injury. 2013;44:735-742. Palm H, Jacobsen S, Sonne-Holm S, Gebuhr P. Integrity of the lateral femoral wall in intertrochanteric hip fractures: an important predictor of a reoperation. J Bone Joint Surg Am. 2007;89:470-475. Marsh JL, Slongo TF, Agel J, et al. Fracture and dislocation classification compendium – 2007: Orthopaedic Trauma Association classification, database and outcomes committee. J Orthop Trauma. 2007;21:S1-S133. Baumgaertner MR, Curtin SL, Lindskog DM, Keggi JM. The value of the tip-apex distance in predicting failure of fixation of peritrochanteric fractures of the hip. J Bone Joint Surg Am. 1995;77:1058-1064. Rubio-Avila J, Madden K, Simunovic N, Bhandari M. Tip to apex distance in femoral intertrochanteric fractures: a systematic review. J Orthop Sci. 2013;18:592-598. Bolhofner BR, Russo PR, Carmen B. 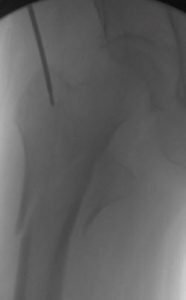 Results of intertrochanteric femur fractures treated with a 135-degree sliding screw with a two-hole side plate. J Orthop Trauma. 1999;13:5-8. Gadegone WM, Salphale YS. 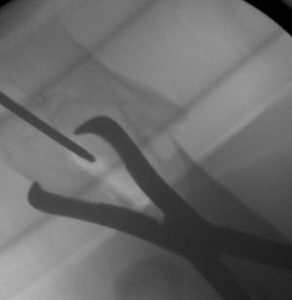 Short proximal femoral nail fixation for trochanteric fractures. J Orthop Surg (Hong Kong). 2010;18:39-44. Okcu G, Ozkayin N, Okta C, Topcu I, Aktuglu K. Which implant is better for treating reverse obliquity fractures of the proximal femur: a standard or long nail? Clin Orthop Relat Res. 2013;471:2768-2775. Gallagher D, Adams B, El-Gendi H, et al. Is distal locking necessary? A biomechanical investigation of intramedullary nailing constructs for intertrochanteric fractures. J Orthop Trauma. 2013;27:373-378. Kane PM, Vopat B, Paller D, Koruprolu S, Born CT. Effect of distal interlock fixation in stable intertrochanteric fractures. Orthopedics. 2013;36:e859-864. Paul O, Barker JU, Lane JM, Helfet DL, Lorich DG. Functional and radiographic outcomes of intertrochanteric hip fractures treated with calcar reduction, compression, and trochanteric entry nailing. J Orthop Trauma. 2012;26:148-154. 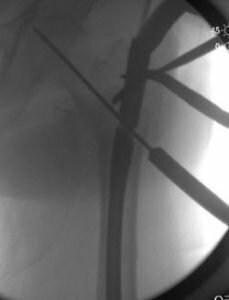 Hak DJ, Bilat C. Avoiding varus malreduction during cephalomedullary nailing of intertrochanteric hip fractures. Arch Orthop Trauma Surg. 2011;131:709-710.